In the fall of 2016, since CAAP announced that Senator Yudichak had filed S.B.1379 which would weaken Pennsylvania’s strong predatory lender laws, many of our newsletter readers have asked for more details about the bill. In particular, people want to know what specifically does S.B.1379 do that is harmful. We’ve included an analysis and interpretation below. However, the Senate reconvenes on November 16, 2016, and the House on November 14-15, 2016 for the last sessions of 2016. At this point, S.B.1379 is unlikely to go anywhere – thanks in part to your efforts and those of the Stop Predatory Payday Loans in PA Coalition. However, we must stay well-versed in S.B.1379 and the below talking points because it is very likely that payday lenders and Senator Yudichak will refile another bill in 2017 that will utilize similar language and tactics that we saw in S.B.1379. Over the last several years since payday lenders have pushed efforts to legalize their predatory products in Pennsylvania, they repeatedly try to put a new wrapper on the same destructive package with names like “short-term loans,” “micro-loans,” and “fresh start.” This session, they worked to legalize long-term payday loans in Pennsylvania by authorizing the “Financial Services Credit Ladder.” Make no mistake--the legislation does not give struggling Pennsylvanians a leg up the financial ladder. S.B.1379 is a descent into debt. S.B.1379 would eliminate Pennsylvania’s existing cap on fees and interest for consumer loans that has effectively kept predatory payday loans out of our state. The legislation hides the cost of the loans that it would legalize. It authorizes 36% interest, but payday lenders also will be able to charge other fees that could push the effective interest rate into the triple-digits. We will not even know the exact cost of the loans until after the bill has passed when the Department of Banking and Securities sets a fee schedule. Based on what payday lenders offer in states where they are legal, the costs will be astronomical. As shown above, in California, payday lenders offer a loan similar to what would be authorized by S.B.1379: it carries an effective interest rate, with fees, of 218%. 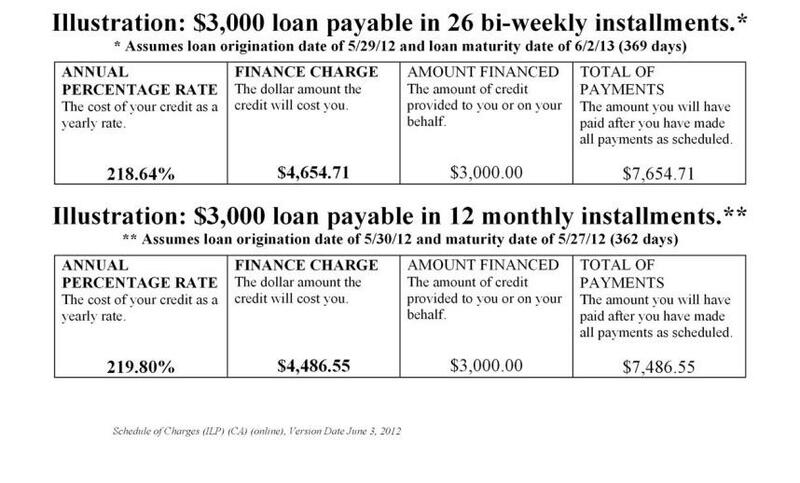 For a $3,000 loan, a borrower pays back nearly $7,500 over the course of one year to get out of debt. That is a loan product that causes, rather than relieves, financial distress. The long-term payday loans that would be authorized by S.B.1379 are just another debt-trap product. They are structured to have multiple payments with a longer repayment period than the traditional, single balloon-payment payday loan, and they usually have higher loan amounts. Despite their installment terms, they carry the same predatory characteristics as balloon-payment payday loans, with the potential to be even more dangerous to borrowers. Long-term payday loans involve extremely high costs, generally over 200% with both fees and interest, lender access to the borrower’s bank account, repayments tied to payday, repeat refinancing, and high defaults. The loans remain profitable to payday lenders because they can collect more in fees than the principal loaned long before the end of the loan term. In other words, the lender profits and succeeds while the borrower fails. The U.S. Department of Defense found that these long-term payday loans were just as harmful to the finances of our nation’s soldiers as two-week loans. It recently revised its regulations to protect active-duty soldiers by capping the total cost of these long-term payday loans, including both fees and interest, at 36% annually, a similar protection to what we have in Pennsylvania for all residents. Predatory payday lending has disastrous effects on individuals and communities. In states where predatory payday loans are legal, borrowers are trapped in high-cost, long-term debt, leading to a cascade of financial harms. Payday lending causes borrowers to fall behind on other bills, to delay medical care, to overdraft their bank accounts, and even to file for bankruptcy. Payday lending also negatively impacts the community and economy, draining jobs and increasing usage of government resources, such as SNAP. Communities with payday loan storefronts report strains on local food pantries and charitable emergency relief services. Finally, payday loans were found to undermine military readiness because of their harm to soldiers. Pennsylvania’s strong law already protects against predatory payday lending. Proponents of S.B.1379 cite proposed national rules on payday lending by the Consumer Financial Protection Bureau (CFPB) as a model for the legislation, as well as a study by the Pew Charitable Trusts as evidence of the need for these loans. But, the CFPB, unlike Pennsylvania, cannot cap the rates on consumer loans, which is the most effective way to protect borrowers from predatory practices. Changing our law by adopting the CFPB proposal in Pennsylvania will weaken it. Pennsylvania already has one of the strongest predatory lending laws in the country, as recognized by both the U.S. Department of Defense and the CFPB. In fact, the same Pew Charitable Trusts study cited by supporters of S.B.1379 does not recommend law changes in the 15 jurisdictions, including Pennsylvania, without high-cost payday lending. Our law has been effectively enforced against predatory lenders operating in storefronts and online. We need to keep our law strong. As you meet with House and Senate members, CAAP encourages member agencies and the public to continue to discuss the harmful effects that nice-sounding “Financial Services Credit Ladder” type products have on our low-income communities. You can cite S.B.1379 as a current specific tactic payday lenders have executed to weaken our laws. Let your representative know that we expect a new bill will be filed once again next year and that you will be asking them NOT to sponsor such legislation.